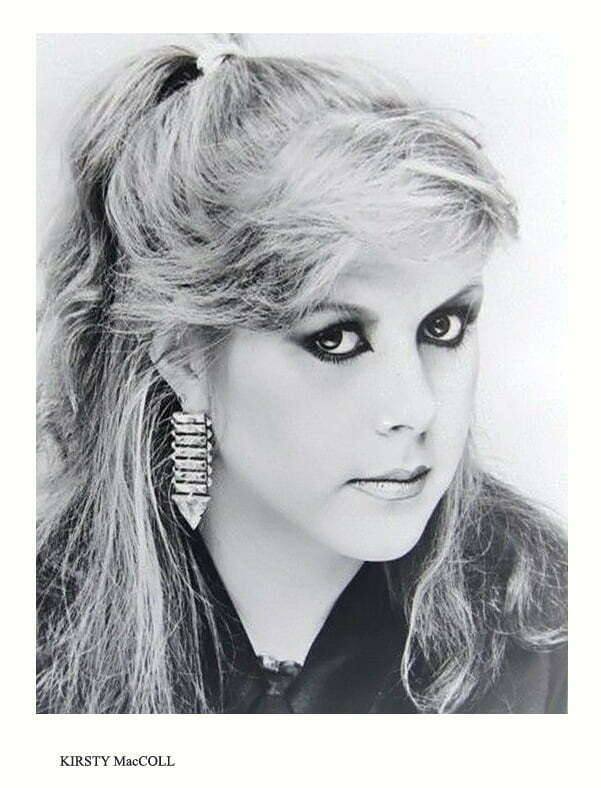 Kirsty Anna MacColl was born in Croydon, South London on 10th October 1959. Her father was the legendary folk singer Ewan MacColl, though she grew up seeing him only at weekends, being raised by her dancer & choreographer mother, Jean Newlove along with brother Hamish. Being older, it was Hamish’s record collection which the young Kirsty commandeered, to immerse herself in the sounds of the Beach Boys and Neil Young, which she later credited with inspiring her love of harmonies and songwriting skills. On a sidenote, common mistakes in spelling her name include Kristy MacColl, Kirsty McColl, Kirsty MacCall or Kirsty McCall. None of these are true but if you searched for one of those you’ve come to the right place! In 1978, Kirsty joined a minor league band called (in the spirit of the times) the Drug Addix, masquerading as Mandy Doubt. They released one EP on Chiswick Records, and Kirsty then spent the rest of her life trying to pretend it never happened! The Drug Addix are frequently referred to as a ‘punk rock’ band, but that’s a bit of a stretch, perhaps more ‘pub rock’. On the back of some demos for Stiff Records, Kirsty was auditioned as a solo singer, and having no songs to sing, had to come up with one pronto – so she wrote They Don’t Know, and it became her first single in June 1979. She got the deal! Even in those early days, Kirsty soon discovered how fickle the record business is and, having recorded another single which was co-written and backed by the Boomtown Rats, she found herself off the label and the single binned. Off to Polydor then and, after her rather fine cover of the Gerry Goffin & Carole King hit Keep Your Hands Off My Baby did nothing, in May 1981 she hit No. 14 in the UK chart with the highest ranking composition of her entire career – There’s a Guy Works Down the Chip Shop Swears He’s Elvis, a witty rocking number pointing the finger at lying scoundrels everywhere, a theme she would return to with relish throughout her songwriting life. In June 1981 an album, ‘Desperate Character’, was released on Polydor featuring a collection of snappy Kirsty songs along with a few covers of 60s songs. It didn’t trouble the charts, and was in fact unknown to all but her most long serving and devoted fans from the time. Another two singles – the self-penned See That Girl and the Beach Boys cover You Still Believe in Me were unjustly ignored prior to Polydor parting company with Kirsty. After a one off collaboration with Matchbox and one single for North of Watford records which nobody in the ‘Kirstysphere’ has ever set eyes on, she returned to the Stiff label and promptly released what really should have been her second hit, the fine song Terry (is as tough as Marlon Brando). Success eluded her for just two months however, and in December 1984 she hit No. 7 with her version of Billy Bragg’s A New England. Her knack for spotting a killer song and her persuasiveness in having the song’s author write an extra verse just for her paid off with what would be the biggest solo chart success of her career. The next single, He’s on the Beach six months later inexplicably got nowhere and her second spell with Stiff came to an end. In November 1987, Kirsty got to No. 2 in the chart performing with the Pogues on what has since become a perennial Christmas hit, Fairytale of New York, but having met husband Steve Lillywhite at a Simple Minds session in 1983 she largely spent the second half of the Eighties raising her two sons, with periodic appearances as a backing singer for a range of top acts of the day. Kirsty returned to the studio with Virgin for the 1989 release of what many still consider to be her best album, Kite. Preceded by the minor hit Free World in February, the album came out in April and reached No.34 in the album chart. A second hit, the Ray Davies song Days followed, reaching No. 12. Miss Otis Regrets was recorded, again with the Pogues, for the AIDS awareness project ‘Red Hot & Blue’ and with their help, Kirsty returned to live performance having been rather put off by an early experience touring the ballrooms of Ireland. In 1991 Kirsty teamed up with Smiths guitarist and songwriter Johnny Marr on much of her next album, ‘Electric Landlady’. This was heralded by the rap infused dance hit Walking Down Madison; the album also featured Kirsty’s first fully formed attempt at using a Latin approach (kindled by her work in New York on a David Byrne album years earlier) with the ever popular My Affair before being dumped by Virgin and hitting a slump including the breakup of her marriage to Steve Lillywhite. Not being one to give up however, Kirsty bounced back in 1994 with what she termed her “sad divorce album”, Titanic Days. The single announcing the album’s imminent arrival was Angel (floating round this house). Also featured was a song which was to become almost her signature tune, and the inspiration for their memorial gesture years later – Soho Square. Kirsty later said that had she realised how much people liked it she would have included the song on her Galore retrospective in 1995. ‘Galore’ itself was a highly successful collection, and added two new songs – “Jolene’s revenge” song, Caroline, and a cover of Lou Reed’s Perfect Day with Evan Dando of the Lemonheads. It reached No.6 in the UK chart, and stayed in the chart for 27 weeks. After 1995, everything went quiet again as far as the record buying public were concerned. During this spell though, Kirsty was finding her feet again having almost decided to give up the music business completely. She decided to get busy and toured South America and Cuba extensively. An excellent collection of old radio sessions was put out in 1998 by Hux Records to keep her profile somewhat prominent. In early 1999 Kirsty fell in love again and started to work on a bunch of new material which she’d started out in Brazil and in Cuba, meshing Latin rhythms to the her familiar lyrical dexterity and wit. She proclaimed herself “a Latin soul trapped in an English body” and got to work in Pete Glenister and Dave Ruffy’s studio in Bermondsey. The resulting tracks, featuring samples from Kirsty’s by now extensive collection of Cuban records brought back from her numerous trips, were to become released to much acclaim as the album Tropical Brainstorm. A whole new generation heard Mambo de la Luna and In These Shoes? and became lifelong fans. Kirsty had already started work on her next album and was working on various side projects when she decided to take a well earned break after a year of promotional work and touring. She flew to Mexico with her partner James, and two sons Louis and Jamie. On December 18th 2000 her love of diving cost Kirsty her life when a powerful speedboat hit her off the coast of Cozumel island, while she swam with her sons in a cordoned ‘swimmers only’ area. The following days her photo was prominent on almost all the British newspapers and it became apparent how substantial her support amongst the public was, though she had only latterly begun to appreciate it herself. At her public memorial service, major rock stars and television actors mingled freely with the public, everyone united in their grief. Kirsty’s mother Jean launched the Justice for Kirsty Campaign to pursue those she deemed responsible via the British and Mexican governments. The campaign succeeded in achieving widespread publicity and local safety initiatives, though it failed in its central aim of bringing those in charge of the powerboat to justice. Kirsty MacColl’s music lives on as testimony to her skills as a wordsmith and arranger of lasting quality songs. Her qualities as a person live on in the memories of her family and friends. Comprehensive coverage of all aspects of Kirsty’s career can be found in these pages. This is Freeworld. Thank you for visiting. Tropical Brainstorm is a favourite album when driving to visit the grandparents – although our 12 year old son is still a little unsure what “Us Amazonians” is about – but life enlighten him on that one!! Hi. a friend of mine says he heard a version of Kirsty singing I knew the bride when she used to rock and roll. We have looked high and low and cant find it. could you let me know how to find it. No I can’t think who it might have been. Carlene Carter maybe? Freeworld has always been THE place to find out everything worth knowing about the btiful Kirsty and now it’s even better. I’d love to know where I can buy photos of Kirsty. The site is now even better. Hugely improved. Well done. Love it.